We’ve got some yummy recipes this week that will be easy for me to prepare with our busy schedule. Crockpot Beans and Rice– I will make the rice in the rice cooker. Super easy! Do you have a rice cooker? We will have a dinner salad as well. Baked Chicken Tostadas– using the leftover crockpot beans in place of refried beans. Served with Puerto Rican rice. A1 and Dijon Crockpot Steak– this sounds amazing! Served with mac and cheese and a green veggie or dinner salad. If there are any beans still leftover, we can eat those up as well. Taco Muffins– served with leftover Puerto Rican rice and a steamed veggie. Crockpot Lemon Chicken– I still have not shared this recipe with you guys. It is amazing! I will try hard to post it on my site soon (or guest post it on another site and share the link with you guys). Served with pasta and french bread. French Bread Pizza– it does not get any easier than this! By the way, did you know that using your crockpot saves you money? Stephanie, from the site A Year of Slow Cooking found that it only costs $0.02 per hour to cook in your crockpot. That is something to think about. Do you need meal planning inspiration? Bored with the recipes you are making? 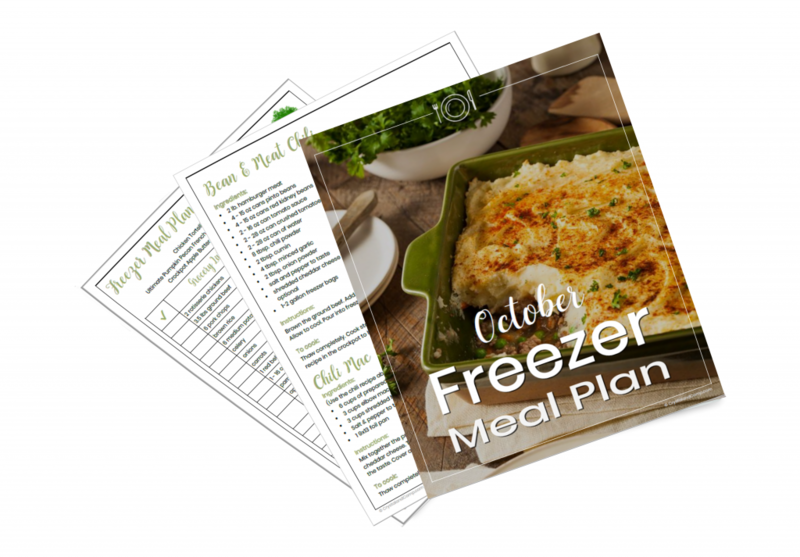 Want to get started with meal planning? Hop on over to OrgJunkieand get involved each Monday! It is rainy and chilly here in Texas. Last week brought us amazing weather and then this week we are starting off so chilly. It feels like December. Here is what is for dinner at our house this week. Baked Mustard Salmon– served with steamed rice and asparagus. Italian Seasoned Salt Crockpot Chicken– served with a steamed veggie, dinner salad and rolls. Crockpot Chicken Fried Rice– served with eggs rolls. Crockpot Sloppy Joe’s– this was a huge hit at our house a few weeks ago. Beyond simple. Served with baked beans and tator tots. Individual Pizza’s– the kids love to make their own pizzas! Served with fruit. What is for dinner at your house? Need more inspiration and recipe ideas? 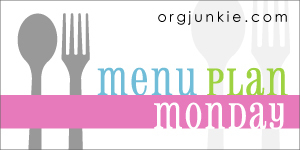 Check out Org Junkie every Monday for a long list of other blogger meal plans. Did you start the first week of January with a meal plan? Excited about how much simplicity this plan is going to bring to your life and home? Easier than you thought it would be? If you missed any of the meal planning series so far, you can read each step here. Now it is time to put your meal plan to work. Each week when I make my meal plan, I do not assign a day of the week to each meal. For me, it is a little too bogged down to assign a specific day to each meal. If you like that level of structure go for it! Tonight when I am cooking dinner, or after dinner is done and kids’ are starting their bath/shower routine, I start going over our schedule for the next day. Do we have any extra curricular activities tomorrow evening? Will tomorrow be a busy day of errands and running around after school? Is tomorrow an easy day with not much planned? All of these questions help me determine if a crockpot meal, a casserole, a one-pot-stove-top-dinner, etc. is going to be best for tomorrow night. I look over my meal options for the week and determine which one we will have for dinner tomorrow night and place it in the fridge in a container so it can start defrosting. Do I ever fail or forget to plan ahead the night before? Of course- I am human. In these situations this is what I do…. Many crockpot meals, especially those using whole chicken breasts, the meat can be placed in the crockpot frozen. Say I forgot to plan ahead the night before and today we have a super busy after school schedule- meaning I want a meal that does not require more than tossing everything into a crockpot. I look over my weekly meal plan for a chicken crockpot dinner (which is a very common listing on my meal plan). I now have nothing to worry about. Toss it in, and go. 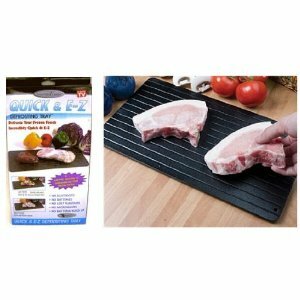 Use a thaw board/tray to defrost the meat you forgot to place in the fridge the night before. I’ve had this handy little gadget since way before I had any children and I use it a lot. I just place the thaw board in a plastic container with the frozen meat on top of the board (any liquids are then caught in the container during the thawing process) and my meat is defrosted in 1-3 hours depending on the type. Defrost your meat in the microwave. I am not a big fan of this, I would rather use the thaw board, but many people do use the microwave. And it works! 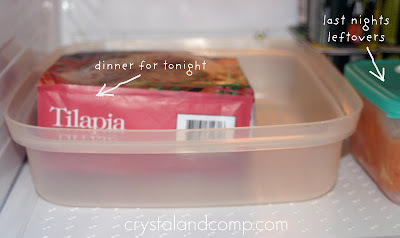 If you pre-assemble any of your casseroles, here is a tip that one of my friends will do on a pretty regular basis. If she is planning to serve her family a casserole for dinner tonight, she will take the frozen and pre-assembled casserole and place it in your oven before she leaves for work so it can begin the defrosting process. She will set the delay start on her oven to begin cooking at a time that will ensure the casserole is done cooking about the time she gets home from work. I’ve always thought this was a really good time saver. If your family eats a lot of chicken, spend an hour over the weekend and grill up 10-12 (or more) chicken breasts. Once cooked, dice them up and bag them and freeze them into portions. This way you have cooked chicken on hand for any school/work night dinner saving you a lot of time. You could do the same thing with rotisserie chickens from the deli. Debone and shred the chicken and portion it out and freeze. You could also easily batch cook multiple pounds of ground hamburger meat and portion out and freeze for easy dinner solutions during the busy school/work week. Have a leftover night on your meal plan. This is a great solution for an oops night and it prevents wasting food!